Zombies are destroying the city!!!! – Prepared for the fierce battles between the special squad heroes and ferocious zombies in most addictive defense zombie game. Use your skill and intelligence to lead your special squad team to defeat all the ferocious zombies to save the city. Each unit of the special squad heroes team have different characteristics, for example: Sniper have big damage, long range but low speed attack, less health. Double Pistol have normal damage, but higher speed attack, more powerfull when upgrade. Also there are many types of zombies, each zombie also have different characteristics and ability, for example: Mad Zombie have very hight move speed, attack speed, but less health and have a very ability is you can not freeze this zombie. Freeze Zombie have very hight health, but lower move speed and attack speed and have a very terrible ability, this zombie can freeze the unit. – Over 8 units with different skill and strength. – Fully upgrade(health, damage, range, critical?) of each Unit with star. – Get your free ward every day, many times within day. – Over exciting 40 levels. The difficulty of each level will be increased, requires you must have a great skill to complete. – With the library system, you view detail of zombie?s information, this will help you have reasonable tactic to kill every zombie. 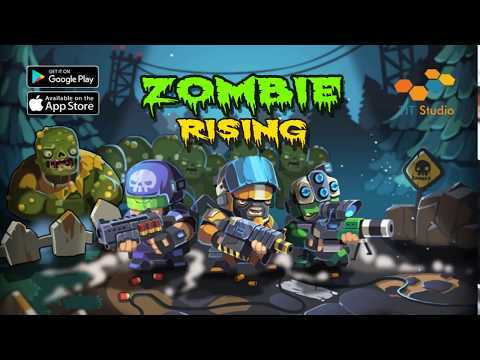 – Zombie Rising is one of the best defense game 2017. Please play the game to have the best experience! – Support many platform: iOS, Android, OS X, Window. – Over 40 levels were designed very good, you can easily create new level with Editor. Units, Enemies, Quests, Products ? You can also easily edit with Editor. – Get Daily Reward: Player have to Share Facebook to get reward. – Smart Advertising. You can edit when and where ad will be shown. The Ads networks have been adjusted properly to bring the highest profit (Chartboost, UnityAds, Supersonic). – Diversity Quest Systems, each quest will never end. It will always increase after completed. – Boost x2, x3, x4 EXP: Player can buy the boost exp package. – Local notification: When full energy, can get reward and after 2 days if player don?t login game. – Energy system: Player have to using 1 Energy to player 1 level. Energy will be refill in some minutes and the time to refill energy will increase after each level. – Game were designed perfect (feedback from player).